The Truman State University Foundation has received a grant of $10,000 from the National Council for Behavioral Health. The Foundation was selected as the nonprofit of choice by Preferred Family Healthcare of Kirksville after the organization received the 2015 “Excellence in Addictions Treatment Innovation Award” at a recent conference of the National Council for Behavioral Health. The prestigious award recognizes behavioral health organizations for excellence in delivering treatment and support in the community to persons with mental illnesses and addiction disorders. It also honors passionate, committed and outstanding behavioral health leaders. Part of the award included the opportunity to contribute $10,000 to a nonprofit of the recipient’s choice. The $10,000 grant will be added to the endowment of the Preferred Family Healthcare Scholarship at the Truman State University Foundation. The scholarship, established in 2004, provides support to Truman students who are psychology majors, residents of Missouri, are in good academic standing and have compiled a record of service to community and civic organizations. Preference is given to employees or dependents of employees of Preferred Family Healthcare. The grant will boost the endowment value of the Preferred Family Healthcare Scholarship to more than $85,000. Since its origination, a total of $9,200 has been awarded to 14 students from the fund. 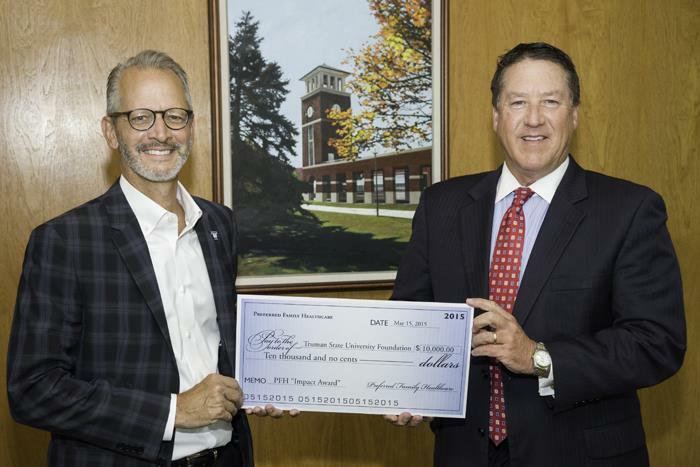 Michael Schwend, president and chief executive officer of Preferred Family Healthcare, presents a check for $10,000 to Truman State University President Troy Paino (left). The donation will support the Preferred Family Healthcare Scholarship, which is awarded to Truman students through the Truman State University Foundation. 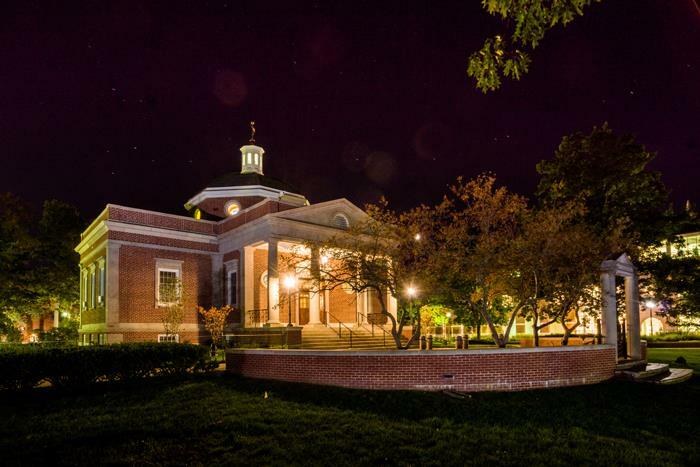 Truman is one of 20 public colleges profiled as a "Best Buy" school in the 2016 Fiske Guide to Colleges. For more than 30 years, Fiske Guide to Colleges has chosen a select group of schools, noted for quality academic offerings and affordable cost, for its annual Best Buy list. All of the Best Buy schools fall into the inexpensive or moderate price category, and most have four- or five-star academics ratings. Truman was the only Missouri public school to be included among the 2016 Fiske Best Buy schools. 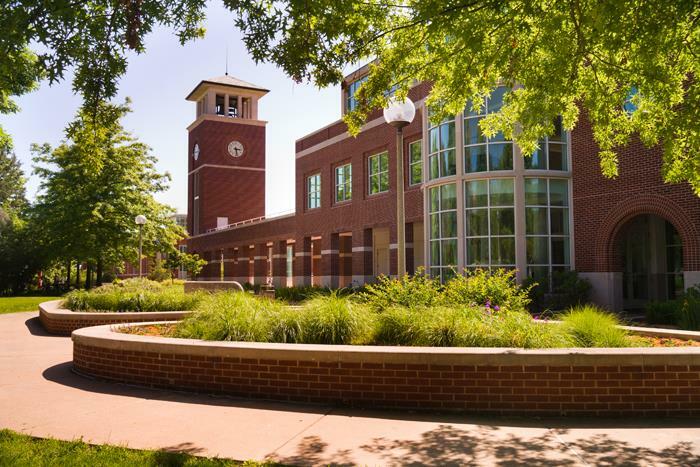 The Institutional Actions Council of the Higher Learning Commission (HLC) has affirmed the accreditation of Truman State University through 2024-25. The report from the HLC visiting team was positive, noting that all criteria for reaffirmation had been met and no interim monitoring was recommended. Truman has been fully accredited since 1914 by the Higher Learning Commission of the North Central Association of Colleges and Schools. 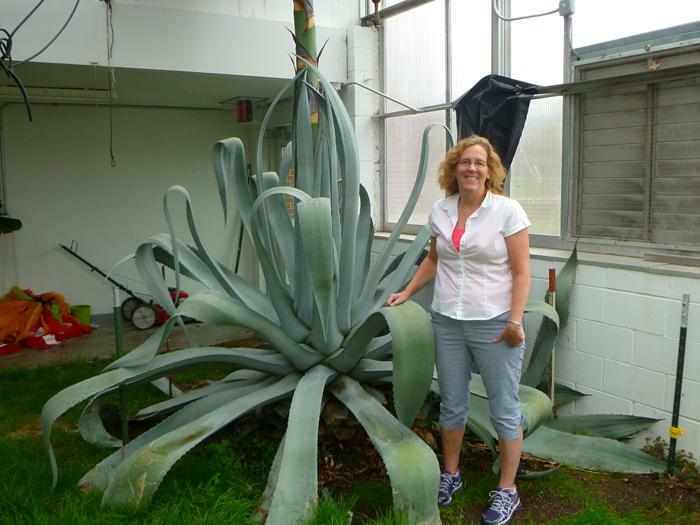 Truman’s Agave Americana plant is finally in bloom, and the University Greenhouse will host one final open house from 4-6 p.m. July 16. Estimated to be approximately 50 years old, the agave gained national attention in the spring when its stalk grew nearly 20 feet, prompting the removal ceiling panels in the greenhouse to accommodate the plant. The agave’s entire life has been leading up to this moment, when it can flower and produce seeds. After the plant finishes its flowering cycle it will soon die. The University Greenhouse is located at the south end of Magruder Hall on Patterson Street. Guests are asked to enter through the west door, near the loading dock. For more information about the agave, or the open house, contact Elisabeth Hooper or Jenna Canfield. 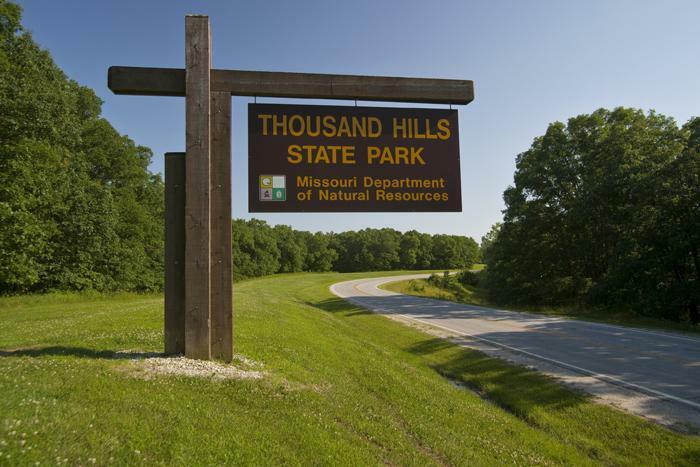 The Institute for Academic Outreach invites families of Truman faculty and staff to join 40 visiting Taiwanese high school students and their teachers for a picnic beginning at 5 p.m. July 19 at the Thousand Hills State Park Point Shelter and continuing until approximately 8 p.m. The event aims to provide participants the opportunity to interact with American families, practice their English in conversation and play traditional summer picnic games. Families with children are strongly encouraged to bring the whole family, and it is hoped all will join in activities to create some of the atmosphere normally achieved with homestay visits. Food will be served beginning around 5:30 p.m., and families wishing to eat should plan to arrive during the earlier side of the picnic, as food tends to go fast. Individuals or families planning to participate should RSVP to the Institute no later than 5 p.m. July 15 by calling 660.785.5384 or emailing Jared Young at jyoung@truman.edu. Please indicate the number of people expected to participate, as well as any food allergies for which the staff should be aware. Vegetarian options are already accounted for in the menu. Taiwan at Truman hosts alternating classes of male and female students from Zen Del High School each summer for a five-week intensive English language and culture program. The object of the program is to strengthen student confidence in English communication and broaden students’ understanding of American culture. The Institute appreciates the support of all who are willing to help make this an enriching experience for the students. Middle school students interested in health careers and science can get hands-on experience during the Adair County MASH Camp, July 21-22. Each summer the Northeast Missouri Area Health Education Center (NEMO AHEC) presents a MASH (Missouri AHEC Science & Health) Camp for area middle school students. The camp exposes students to a variety of careers in the science and health fields. MASH Camp will take place from 8 a.m.-4 p.m. July 21-22 at Truman and the Northeast Regional Medical Center. Area health care providers and educators will combine their talents to present an impressive instructional program that will introduce students to the fascinating world of science and health care. Students will participate in biology labs, scrub labs, suture labs, hospital exploration, recreational activities and more. Any student who will enter sixth, seventh or eighth grade in the fall is eligible to attend. Registration requires a $45 fee for meals, activities and T-shirt. A limited number of scholarships are available to families in need. Registration information can be found online at nemoahec.org. MASH Camp is sponsored by A.T. Still University, Truman, Northeast Regional Medical Center and the Missouri Area Health Education Centers. Application for parking permits can be completed online via TruView. Verify local Kirksville address and phone. If changes need to be made, use the link available and make the correct changes. When registering for a parking pass, students must have their license plate number. After the registration form has been completed for the parking permit, a parking decal will be assigned and the student account will be charged $120 for a resident pass. The freshman parking permits will be included in the residence hall check-in packet if the registration form is completed prior to Aug. 1. Late registrations, commuter parking permits and upperclassman parking permits will be processed and distributed from Parking Services Office, General Services Building 100, Building No. 14 on the campus map. If there are questions or problems getting a parking pass, the Parking Services Office will be open on Freshman Move-In Day, Aug. 15, from 9 a.m. until 3 p.m. The Parking Services phone number is 660.785.7400. The parking permit only gives the right to park on campus, it will not guarantee a parking space. Check the parking map to see the areas designated specific decal color. Volunteers are needed to assist with the new student welcome picnic from 6-7:30 p.m. Aug. 16 at a location TBD. Anyone willing to volunteer should email Jacey Wood at jacey@truman.edu. For more information about the picnic contact Wood at 660.785.5404. Truman faculty, staff, students or student organizations interested in helping during the new student move-in Aug. 15, may register here. The last day of group exercise classes during the summer is July 24. 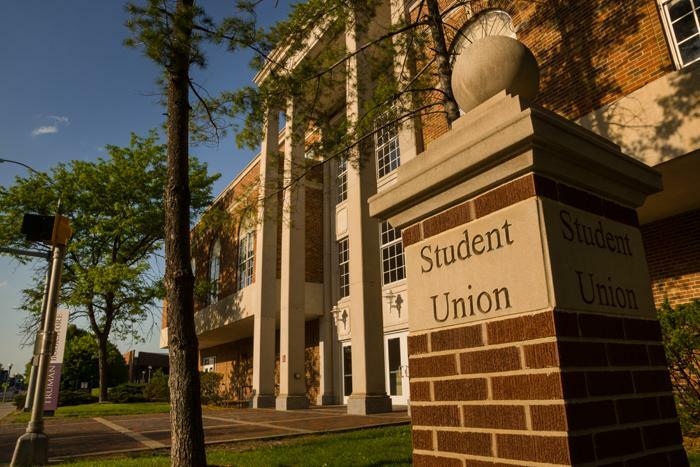 Fall classes will begin Aug. 20. To view the tentative fall schedule, click here. The University Bookstore, located in the lower level of the Student Union Building, is offering 30 percent off already reduced items through July 26. Offer does not include food items, Starbucks products or graduation items. Offer is only valid while supplies last and cannot be combined with any other offers. See store for details. The next issue of the Truman Today will be available July 27. Every year, the Paul & Daisy Soros Fellowships for New Americans awards 30 fellowships to immigrants and the children of immigrants who are pursuing graduate education in the United States. Each award is worth up to $90,000. This includes up to $25,000/year stipend and up to $20,000/year tuition support. Awards support up to two years of full-time graduate study in any field, including the visual and performing arts, and at any graduate-degree granting institution in the United States, with the exception of online programs. In addition to funding, Fellows join a community of more than 500 New Americans with family origins in more than 75 different countries. The fellowship program looks for applicants who have demonstrated and sustained accomplishments that show creativity, originality and initiative. The fellowship looks for evidence that an applicant’s proposed graduate training is likely to enhance future creativity and accomplishment, and that the individual has a commitment to responsible citizenship in this country. For information on eligibility requirements or to apply, visit the Fellowship website. Applications are due by Nov. 1.